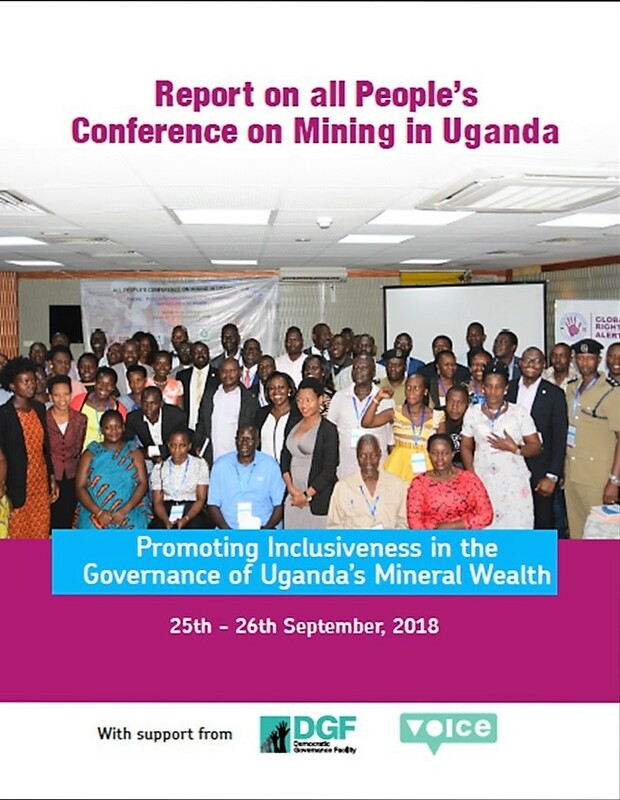 This report presents proceedings from All People's Conference on Mining in Uganda held on 25th & 26th September, 2018 under the theme, "Promoting inclusiveness in the governance of Uganda's mineral wealth,". The conference was organised by by Global Rights Alert (GRA) in partnership with Action Aid Uganda (AAU), Publish What You Pay (PWYP - Uganda) and Mubende United Miners Assembly (MUMA). Find herein the report from the National Stakeholders Dialogue on Artisanal and Small Scale Mining in Uganda held in November, 2017. Find herein an assessement of Gender Sensitivity in Uganda's Extractives Industry: A case of Buliisa, Hoima and Mubende districts. Here find Hoima District Property Compensation rates translated into Runyakitara, a local dialect spoken by the largest population in oil rich Hoima district. The report focuses on the impact of the NGO Act, 2016 on the operations of Civil Society Organisations in Uganda’s oil and gas sector. It recommends that Civil Society as a sector should rally together and advocate for regulatory regimes that promote their work. Herein find a a report of the Committee of Parliament on Commission, Statutory Authorities and State Enterprises (COSASE) investigations into the circumstances under which the reward of Shs 6 billion (oil money) was given to to 42 public officers who participated in the Heritage oil and gas arbitration case. Herein published the NGO Regulations, 2017 that guide the implementation of the NGO Act, 2016. This Manifesto helps citizens share with their leaders what they want done in the extractives sector. The major focus is for citizens to demand for issues listed herein from their leaders or those intending to lead. On the part of politicians this manifesto is intended to guide them into what the citizens want and the issues that citizens would like to see in their manifestos and what they would prefer to be implemented once the leaders are elected. With Uganda expected to start oil production sometime in 2018, during the tenure of a president to be elected this February, the plans that the country’s eight presidential candidates have outlined for the oil and gas sector take on a special significance ahead of this year’s general election.